With the current financial climate as it is, many people may be considering going without a winter holiday this year. However, through booking independently, you can still get a fantastic deal on a retreat to the winter playgrounds without breaking the bank. Some people may have been put off booking their holidays independently because of the hassle factor of searching multiple websites, but careful planning and knowing which websites to use can save a tidy sum for some when compared to brochure prices. Independent travelling also means you get the holiday you want, leaving when you want on the flights you want, staying when you want and returning when you want. "Let’s start with flights; these are probably the biggest expense of an independently booked holiday. However, if booking is timed correctly, this is where the best deals can be had. If Europe is your destination then you can’t go far wrong with the cheap and cheerful budget airlines. They fly to multiple destinations in Europe and cover the main winter destinations - plus they always seem to have a sale on. For example, if you want to travel to the Three Valleys in France, a personal favourite of mine, then there are various options such as Stansted to Lyon or Geneva, or Gatwick to Grenoble. Courchevel is then only a two hour car ride away, for which you can either hire a car or book a transfer to the resort if you are nervous of driving on the continent." "Although not as enticing as it was last season due to the exchange rate, the USA and Canada, and their wide open traffic free slopes (even during holiday periods! ), are still within reach of the budget conscious traveller. Virgin Atlantic or BA’s scheduled flights (6.5 hours) from Heathrow to Boston put the New England ski resorts such as Killington and Stowe within reach." "Again, transfer by bus or hire car can complete the journey within 3 hours. Air Canada or BA Scheduled flights to Calgary (9 hours), then a 1 hour transfer to the rustic mountain town of Banff, bring the Canadian Rockies into play. The Banff area consists of the smaller resort of Banff Mount Norquay, the abundant snow ‘au naturale’ of Sunshine Village and the world famous Lake Louise, with its wide open snow bowls." "From past experience, the scheduled flights for the peak winter season of Jan/Feb are reduced in price in September/October." "Accommodation for both Europe and North America can be booked independently through the usual sources however, booking directly with the hotel can result in reduced prices, especially if booking for a group. Contacting the hotel directly may also enable you to arrange a late check out, allowing you to enjoy a few more hours on the piste. Savings can also be made by booking a room and lift pass together through official resort travel agents. "Usually, a deposit or payment in full is required when booking accommodation. Yet, most hotels in North America only require a credit card to reserve rooms with payment being required upon departure. This spreads the cost of the holiday over a longer period and makes it easier to budget. North American hotels have the added bonus of larger rooms and even some of the most basic chain hotels have indoor, and sometimes outdoor heated swimming pools and hot tubs. Ideal for winding down after a hard day on the mountain. Continental breakfast is sometimes included in the room rate and, the pièce de résistance for families, children stay free in hotels when sharing with parents. This can represent a major saving on the overall cost of the holiday meaning that only the payment for a flight is required for children." "Possible savings don’t end with flights and accommodation. Savings can be made with lift passes if booking multiple days and, as reported earlier, if booked in conjunction with accommodation. 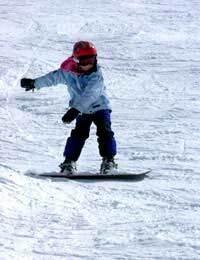 Also, some resorts, such as Killington in Vermont, offer free lift passes for Children if booked with adult lift tickets." "If you don’t already own your own sports equipment then hiring is the best option. Various websites enable you to pre-book equipment resulting in less time in hire shops when reaching the resort. Again, shop around for the best deal for the resort you are visiting. By contacting the hire shops directly you can even sometimes pick up bargains such as free rental for children! "All in all, significant savings can be made if you are prepared to hunt around for the holiday elements that best suit you. These savings may make the difference between having a winter break and sitting at home wondering if only…"